First stadium in this location was built in 1925 and was later expanded in 1975. But, as is indicated by the patron’s name (Jean Bouin was a famous runner), it was a multi-use stadium with athletic track surrounding the sports pitch. As Paris submitted the bid to host 2012 Olympics, it was envisaged that a new stadium would be built here, accommodating field hockey, among other uses. Despite the tournament being granted to London, the plan went forward with rugby superpower Stade Francais at its heart. In late 2007 famous architect Rudy Ricciotti was selected to design it after he filed a unique idea of stadium covered with thousands of concrete prefabs. Well over 3,500 of almost identical elements form the external cladding of the stadium, all with unusual and dynamic shape that results in the new stadium’s exciting texture, hardly comparable with any other. Work on implementing the vision began in 2010 (though regular construction followed in 2011) and lasted until summer 2013. With a budget of some € 110 million Paris received a new 20,000-seater without the former running track, which was relocated. Both fans and extensive commercial spaces and 500-car underground parking are topped with a roof supported by 74 girders. 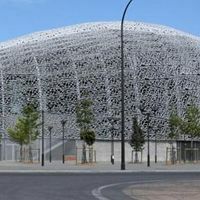 Interestingly, the distinctive bowl of Paris’ new concrete stadium is literally several meters away from the city’s first and most famous concrete giant – Parc des Princes. Named after the famous rugby player from early twentieth century, this stadium was under construction from 2003 and still only just opened ahead of the 2007 Rugby World Cup. As a result it wasn’t the host club, but Australian national team who played host first. After the tournament situation normalized and the €63-million ground began serving club games mostly. Designed by A + Architecture, known for bold ideas, this stadium’s roof is like no other – bending over three stands just to fly up at the east side, resulting in a dramatic effect. Not only the architectural side is interesting though, because each of the four independent stands was named after a different famous… stadium from around the world – Eden Park, Ellis Park, Murrayfield and Twickenham.